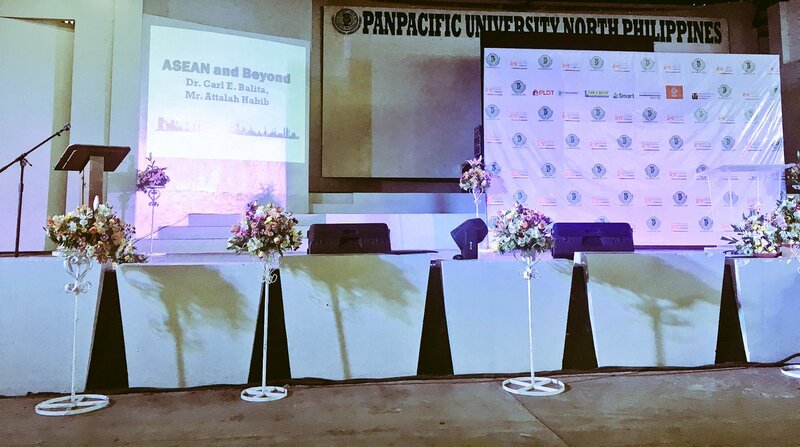 Panpacific University North Philippines (PUNP) (also called Panpacific University), formerly Pangasinan Colleges of Science and Technology (PCST), is a private educational institution established by Dr. Romeo T. Padilla and started its operations in 1993. It currently has two campuses in the province of Pangasinan, one in Urdaneta City and another school based in Tayug. PUNP provides both basic and tertiary education for students in the entire province. The school’s senior high school (SHS) program has three (3) tracks to offer—technical-vocational-livelihood (TVL), academic and sports. A wide variety of college programs are available in the university as well. Program offerings include courses in Criminology, Marine Transportation, Pharmacy, and Tourism Management. Aspiring law professionals can also pursue a degree through its College of Law. PUNP, are you ready for Miss Kylie Verzosa? Are you all ready for this afternoon's event? Palafox Associates will be at the Events Center at 2PM today. Make sure to attend, it will surely be worth your while. Are you at the first Seminar Series for our Foundation Week? Catch Dr. Balita & Mr. Habib as they answer questions during open forum. Watch Panpacifics X Factor Finals on Tuesday, 21 February at 7:00 PM. To apply to Panpacific University North Philippines-Urdaneta City course programs, applicants should be Graduates of foreign and Philippine high schools accredited by the Department of Education (DepEd) may be admitted as freshmen into the University. Transfer applicants seeking transfer admission to Panpacific University North Philippines-Urdaneta City have to satisfy the requirements of as well as those of the college/ degree program to which they seek to transfer.